How's Your GPS Working For You? For most SAR members, their weakest SAR/OSSA skill is using a GPS effectively. Want more training in GPS use? It is really up to each of us to make sure we get the extra training we know we need. We don't have to wait for a scheduled training session to have one. Want one? Don't wait for someone else to plan one (or not); help make it happen. Ask someone who is comfortable using a GPS to mentor you through some field problems navigating to and from a place on a map. Of course, you don't have to own your own GPS unit, but many of us do. But if you are considering upgrading your own GPS unit and wonder which one to buy, here is one to consider. There is no "perfect choice, but a number of SAR members who are GPS-proficient think the Garmin 60Cx is the, or one of the, best unit(s) for SAR use (the costlier 60CSx has several features that don't help us). Among the significant properties of the 60Cx are its superior antenna, its capacity to use topo 1: 24,000 maps (with a additional flash card), its water resistance (it should tolerate submersion to 6 feet or so for 30 minutes), and its battery efficiency—it has a battery life of about 18 hours with alkaline AA batteries.. Here are two videos about a Garmin GPS. For different GPS models, the principles are the same. The first video is very basic. The second demonstrates some of the extensive customization possible on one of the pricier GPS units (<$300). Nobody masters GPS skills by just reading manuals. You have to use the GPS to establish the habits that build skills and demystify the process. Want to get better at using your GPS? Assume the initiative and help make it happen! My feet are one of my weaker links, so I am always on the lookout for ways to minimize blisters, blackened toes, swollen feet and any other foot miseries. Everything starts with a decent boot and a proper fit, but if you don't have "average" or "normal" feet, let alone two feet that are not the same size, keeping your feet happy when hiking with a backpack can be a challenge. Here, from "Backpacker Magazine" is another tactic to try if you haven't solved all of your issues with booted feet. This method leaves wiggle room for toes and swelling feet, but still keeps the heel locked in place. 1) Lace boots normally, but don't pull tight. 2) Tie a snug overhand loop at the ankle to create a locking twist, then wrap laces around eyelets. 3) Repeat the single overhand loop at each pair of eyelets. 4) If the boots feel too tight while hiking, relieve pressure by skipping a pair of eyelets near the top." Saturday's training focused on how to adjust what you wear and pack for colder and wetter SAR missions. Here are a few of the take home points: Don't wear cotton (T shirts, sweatshirts or jeans) during the wet and cold seasons. Avoid down insulation (sleeping bags and jackets) for SAR use as it is useless when wet (hypothermia threat). Both wool and synthetic fleece have advantages and disadvantages for cold/wet weather and "experts" differ on how to use them. Fleece packs smaller and is lighter than wool (in general). Wool may insulate better when wet, but is much slower to dry out while synthetics will wick water away from your skin. Fleece is flammable and wool much less so which is significant when sitting near a fire. Synthetics often absorb and retain body odor more than wool does. Wool products tend to be pricier, but are more "eco-friendly" than plastic products (if you care). Fleece, especially the light (100) and medium (200) grades, is not windproof, but some garments are laminated to minimize this (marked on the garment). Wool garments vary in their resistance to wind depending on the weave and density. Confused yet? There is more to consider. You will be layering your clothes during the wet and cold months. So which material should be used for which layer or is it "wrong" to mix and match? Base layer: never cotton, a wicking polypro or merino wool (finer, less itchy and less likely to hold odor, but not as likely to keep your skin dry). Middle layer: wool or fleece- personal preference. With exertion, you may need to cool off, so consider garments that can unzip or unbutton. Outer layer: conditions will dictate depending on how wet, how cold, how abrasive, etc. The official SAR jacket may not be the best choice for some conditions. During the wet and cold months, Jim takes a bag of weather-gear along with his hasty pack to SAR house when there is a call-out so he can adjust what he wears and packs to suit the mission and the conditions. One surprising outcome of the training session on dressing appropriately for the seriously bad weather missions is that we probably won't be wearing our orange shirts, BDUs or orange baseball caps. And the SAR jackets may not be the best choice to be wearing when you have your hasty pack on in the field. Review your gear as the weather turns cooler and wetter and plan ahead. Good, less expensive options for getting woolen wear are the military surplus store and online outlets, the Goodwill store and second hand stores. Anyone interested in having a SAR swap/giveaway/sale session where we can pass on gear we have ungraded or that doesn't fit, etc.? Jim is a strong proponent for using wool when you are going to get wet (sweat or weather), but he also uses fleece in all 3 grades for insulation. Keep in mind weather-appropriate boots, gloves, hand-warmers, etc.. The training session went into a lot more detail than is possible in the OSSA academy. Bummer if you missed it. What to expect on the trip. 1) The hike in is not particularly challenging, although the last 3/4 of a mile or so is steeply downhill, with switchbacks. On that stretch, you'll need to be careful where to put your feet, but it's certainly manageable. Negotiating that steep stretch is challenging coming out, but we're not going to be racing. You can go at your own pace, and when you get tired (hopefully, before exhaustion), you can stop for a minute or two for a breather. It's how I do it, and it works (this is supposed to be fun, after all). Most of the hike will be on a trail cut into the slopes with a drop-off to the river-side of the trail, and while there isn't a lot of shade, we should beat the worst of the heat and the views are spectacular. About halfway to Pine Flat we'll probably stop for a break at a little creek. (Kate mentioned "knowing your weaknesses" and one of mine is that I need gallons of water, and the creek allows me to replenish.) It's a nice, shady place, and a good campsite, though we'll continue on after our break. We should arrive at Pine Flat early in the afternoon. Throughout the trip, Jim will point out interesting features and edible things. With him, a great hike with wonderful views becomes an excellent nature lesson, too. 2) Pine Flat itself is fairly shady, level ground perched maybe 15 feet above the Illinois river. Once we're there, you'll find a suitable place to pitch your tent and do whatever else you care to do to set up your campsite the way you want it. Then, you may wish to rest for an hour or so, or wander down to the river and soak your feet, bathe, fish or all of the above. After that, some of us may wish to explore a little further up the trail (level ground). Not too far away, there's the ruin of an old homestead where you'll see the remains of a stone chimney and some artifacts — like old bottles and metal objects. Near this, there's a large level grassy field which the trail cuts across. There's an apple tree or two at the far end of the field. There's a little creek a short walk from the campsite where we got our drinking and cooking water when we were there (at the time, there was an algae bloom in the river). 3) We left camp early Sunday morning — around 8, I believe. I found the hike up the steep slope the most challenging part of the trip, but it's perfectly possible to do it if you set your mind to it and don't try to make it into something it's not. When you need to, stop and rest, take a sip of water, and then continue on. You won't be left behind. Once we're past that, the rest of the return is unchallenging. I can't tell you what to take, but I'll tell you how I approach this kind of a trip, and what I'll take. This is a simple overnight-er. Nothing more, and Kate and I'll be sharing stuff (tent and stove, for example). So what do I consider essential, and what do I consider to be unnecessary but might be nice to have? Essentials: My backpack, compass and map (not necessary on this trip, but a habit worth keeping), water bottles/platypus, a few cliff bars, a light tent, a sleeping pad and a sleeping bag, a light windbreaker/rain top, a hat (sun protection for the trail), a flashlight and extra batteries, TP, a first-aid kit (with DEET), a whistle, my Swiss Army Knife, a cigarette lighter, durable match, siliconized tarp, a VHF or FRS radio (on channel 10) plus extra batteries, 2 or 3 empty 1 gallon freezer bags, 50 feet of paracord, and water purifier tablets (that I probably won't use). If you're taking medication, take it. I can survive, be safe, signal in 2 or 3 different ways and be reasonably comfortable with only these items. Non-essentials, but nice to have: I'll take a little pillow. Though I don't need to eat more than my Cliff bars, I'd want something more. I'll add one of those 4 oz foil-wrapped packages of salmon which I'll eat cold, and perhaps a freeze-dried camping dinner which, if I decide to eat it, I'll boil water for. I'll take my Jetboil stove to heat water and a toothbrush to brush my teeth. For breakfast, I'll take a pack of instant oat meal and some cocoa. I'll also have my gaiters (for walking through the field to the apple trees) and a pair of gloves. Near luxuries: These will include camp shoes (crocks), a GPS, an Alternative Auditory Device, a change of socks, a polar-tech pull-over, a watch-cap and a camera. 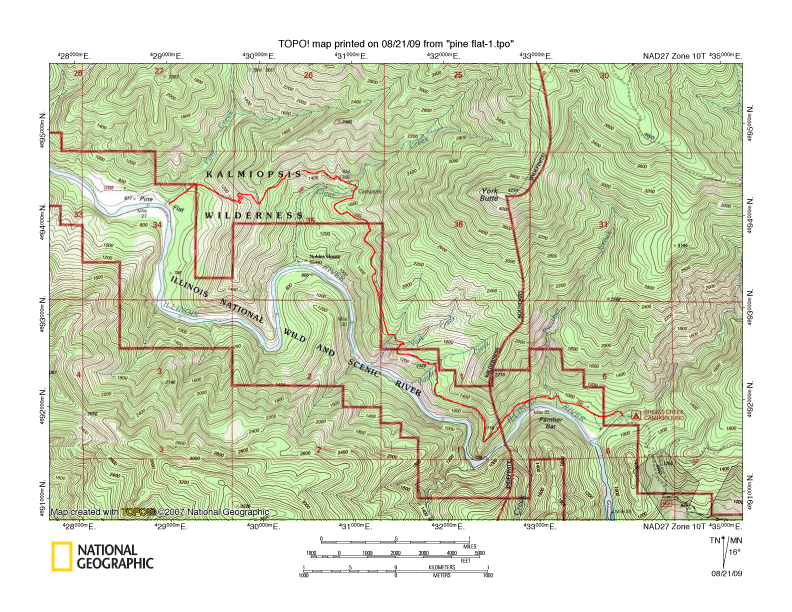 Here is a topo map with the route to Pine Flat (Wilderness Survival Class destination) marked on it from the trailhead to the campsite on the Illinois River. The map is as big as can be for this blog, but you may want to look at a bigger map or topos on a computer for more detail. This image will give you some sense of elevation change, distance from rivers and streams and surrounding landmarks. For a larger image click View this photo. Virtually everyone who has taken their OSSA academy training in Josephine County has heard about using CERTO to prevent and/or treat skin eruptions caused by poison oak. There are no formal drug trials on its efficacy, but anecdotal testimonials abound. Many people made miserable repeatedly from primary or secondary contact with poison oak oils swear that they have had a major reduction in eruptions and discomfort when they use CERTO to prevent or treat an outbreak. Several of our members who have had multiple emergency room visits for severe poison oak outbreaks severe enough to require prednisone insist that CERTO has kept them out of the emergency room and changed their lives. Many more of us with miserable, but less serious rashes, blisters, and sanity-testing itching credit CERTO with giving us the courage to go boldly into that dense brush where so many of our searches take us knowing that CERTO will keep them out of skin trouble. The dosing regimens I have heard used vary widely, but most use 1 Tablespoon of CERTO daily till gone to prevent outbreaks and 1T twice a day til the package is empty if you already have symptoms. We take ours straight off the spoon, but many mix theirs with guava juice, grape juice, cranapple or any other strongly flavored juice. Possible "side effects" appear to be a slight reduction in your cholesterol, risk of colon cancer and arthritis symptoms. Can't get "side effects" like those from too many medications. There doesn't seem to be any consensus on how often to take CERTO prophylactically, but its effect seems to last at least a month. With only anecdotal information available on CERTO, it is hard to know how many people have tried it and haven't found it effective or have had some unpleasant reaction to it. Add your experiences (positive or not) to this post by clicking on the "comments" line below and writing about how it worked, or didn't, for you. Let's start to collect some data on this seemingly marvelous product. If enough people have had some experience with the product we could make up a short questionnaire to collect more formal data and then share the results. There is a "rash" of published material on poison oak, the varieties of plant, source of the irritant causing dermatitis, remedies, etc.. Here is just one, but the internet has over 500,000 entries for it to explore. Please do share your experience with poison oak and CERTO. Monday' nights training session, the under-attended one, was on personal rope safety—certainly a core topic. Jim McNutt was originally scheduled to teach it, but he was out of state at WASAR. So, who was the stand-in for Jim? I will never tell. ;-) But the phantom instructor was prepared with a handout for you from Jim's Personal Rope Safety Techniques book (available here). The bare-bone rope skills everyone in SAR must know cold are these: how to tie a tensionless anchor, a wrap 3, pull 2 anchor, a figure eight knot, follow through figure eight, figure eight on a bight, know how to tie a seat harness, a Munter hitch, a double fisherman bend, a Prusik, how to rig rope with a progress-minding prusik, and rig a personal rope for one way travel with a Munter hitch (to retrieve your rope). Can you tie all these knots? Can you tie them without looking at a picture? Then can you meet Mike Gibb's standard of doing it blindfolded (being able to tie knots in the dark is relevant) and then behind your back (just for showing off)? Terrific! Than based on attendance, everyone knows all the knots! So now you can teach friends and family.